Over the last two-and-a-half years — since Reporting 3.0 decided to become a not-for-profit organization and launch a Work Ecosystem with four pillar on future-ready reporting, new accounting, data architecture and integral business model design — several hundred Positive Maverick experts have joined us in developing the Blueprints. They joined our Working Groups, engaged in Convetit virtual dialogues, attended in-person meetings, and touched base with us in many other ways. Overall, more than actively participating in the Blueprint development process, several thousands of people heard about Reporting 3.0 through our conference talks and workshops held on 5 continents on about two dozen occasions. Some described our work together as “electrifying” and “life changing”! Some said it gave them “ultimate hope” in our collective ability to reverse the exponential upward “hockey stick graphs” of the Great Acceleration. We are convinced we can combat “predatory delay” (as per Alex Steffen) through radically scaled collaboration amongst Positive Mavericks. This series of articles has laid out for you the full Work Ecosystem of Blueprints. And we mapped out actions from the nano (individual) to the micro (organizational) to the meso (industry / portfolio / habitat) to the macro (economic / social / ecological systems) level, which can create snowball effects that lead to the change of our economic system design. From corporations and consultancies and academics, from governments / multilaterals / foundations to investors and NGOs, all have roles to play in the ‘bigger whole’ of their individual mandates, and even beyond those mandates. They have all been addressed in these 23 earlier parts. At Reporting 3.0, we need to make sure that all of this knowledge doesn’t simply sit on a shelf, but needs immediate action. Our know-how can be used by all sorts of organizations, of all sorts of sizes and in all sorts of cultures, as we are all united in the simple fact that ‘there is no sustainable business in an unsustainable world’. Therefore, we have designed the Transformation Journey Program. We developed a modularized framework oriented broadly to everyone interested, wherever you stand in your own development towards aligning to a Green, Inclusive and Open Economy, and whatever level you represent in the nano-micro-meso-macro clustering. 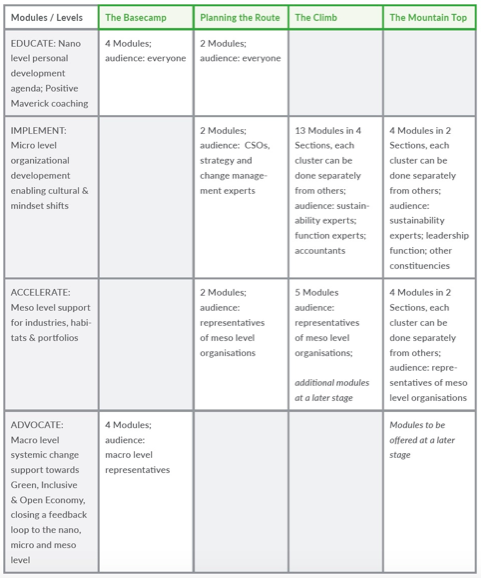 The following matrix shows a broad overview, visualizing the Transformation Journeyas a mountain climb, a metaphor that Ray Anderson introduced to characterize Interface’s journey to sustainability. It took Interface 30 years to reach the mountain top, but all others will have to make it in fewer decades, and collectively. The advantage of this clustering is that you can start your individual journey on the EDUCATE level or collectively on the IMPLEMENT, ACCELERATE and ADVOCATE level. Some of the parts of the clusters are still kept in grey. This is to indicate a) Reporting 3.0 needs to develop additional experience before moving into these parts of the matrix, and b) we’re aiming to do first things first. The more Advocation Partners we have and the more experience we have in the delivery of the Transformation Journey Program, the more parts make sense to fill in over time. Our Blueprint 5, to be released at the 5th International Reporting 3.0 Conference in Amsterdam on June 12/13, 2018, describes all the modules in greater depth by clarifying which “pain points” the modules address and which “gain points” you benefit from. Webcasts: These will provide an overview of what the modules cover and show useful first empowerment tools to start immersing into the specific theme of the module. These can be accessed from anywhere in the world. These webcasts are a low budget item as the fee is just €50 — €100. We may also offer them on demand at a later stage. Generic workshops: Reporting 3.0 will offer workshops for diverse groups of participants. They are organised to cover a full cluster of related themes and are normally 2-day workshops. We are aiming to offer these workshops on different continents. The pricing for these workshops will range between €295 — €595 Euros per person and module. We will cap participation to support maximum benefit for all. Special rates may apply for clusters of workshops. In-house coaching: Reporting 3.0 itself doesn’t consult due to its not-for-profit status, so our Advocation Partners will deliver individual coaching, training or consulting. Based on a 1:1 contractual relationship you can negotiate an agreement with any of them. Please have a look at the Advocation Partner site on our website in case you are interested. That can of course also happen after you attended one of our workshops and feel you need extra help. Reporting 3.0 has partnership agreements with these Advocation Partners and will benefit from those projects through a certain percentage of the revenue. By that they support the global public good character of our work and help to further advance in the future. This is an ongoing agenda for all of us and increased scalability is essential. So, here it is, the grand finale for this series, but hopefully just the beginning of our collective Transformation Journey to creating thriveable organizations that enable system value creation that gets us to the Green, Inclusive and Open economy we so urgently need. We hope all of you will go on that journey with us! Reporting 3.0 is a pre-competitive & market-making non-profit delivering groundbreaking Blueprints & Transformation Journeys for system value creation.